General Description: Slates Hot Springs is also known as Esalen Hot Springs. These are some of the most alluring hot spring baths in the United States. Along the Pacific Ocean in gorgeous Big Sur, are a set of baths perched above the rugged California coastline. Esalen is more than a hot springs it is a retreat center and an educational institute. It is an sanctuary of the mind and body. Reservations are required. Clothing is optional. Location: Located in Big Sur, California. It is south about 3 hours from San Francisco, California. Accessibility: Esalen Hot Springs is very accessible. You can drive up to the resort. There is alot of up and down walking around the resort. The property is handicap accessible. The upper level has its own hot tub equipped with a special lift for handicapped access in addition to a wheelchair-accessible changing room, shower, and bathroom. Hot Springs: Esalen’s hot springs flow at a rate of 80 gallons per minute and emerge at a temperature of 119 degrees. There are two main areas for hot springs which they refer to as baths. The upper level baths is equipped with a special lift for handicapped access in addition to a wheelchair-accessible changing room, shower, and bathroom. The lower level baths contains restrooms and two sides, a "quiet" and a “silent” side. Each side has a changing room and there is a shower room with a glass wall perched over the ocean. There are several tubs, both indoor and outdoor in the lower level, as well as private, clawfoot tubs. 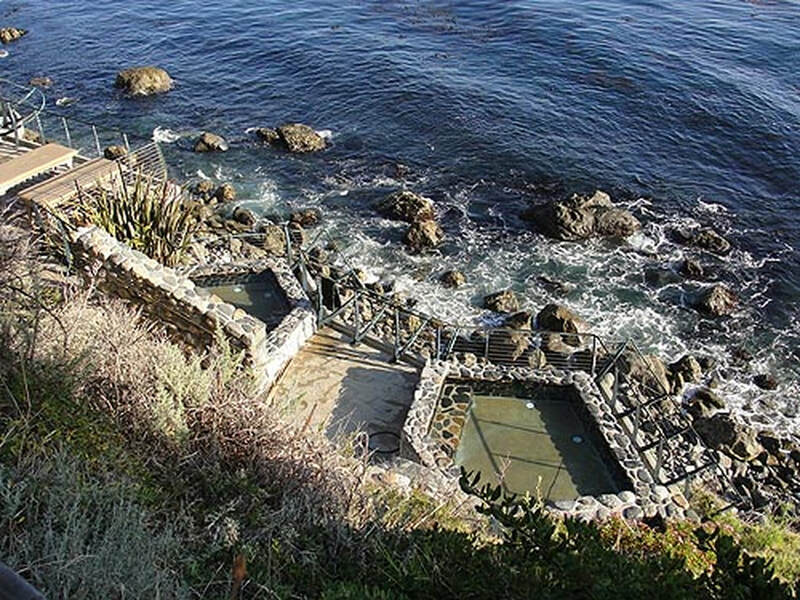 Hot Spring Tips: Esalen Hot Springs is only open to the public in the middle of the night. Reservation are required. Towels are provided. Clothing is optional. The institute offers over 600 workshops and programs per year devoted to cultivating deep change in self and society. Sign up on the website. Big Sur has many natural attractions to see. Make time to explore the area. Youtube Video on Esalen Hot Springs is below.